Edwin Cole Bearss, a widely admired and beloved military historian and battlefield tour guide, served as Chief Historian of the National Park Service from 1981 to 1994. A United States Marine Corps veteran of World War II, Ed was an authoritative presence in the popular Ken Burns Public Television series The Civil War. Born in 1923 in Billings, Montana, Bearss grew up on the rugged family cattle ranch, the “E-Bar-S,” through the depths of the Great Depression. His father, a World War I Marine veteran, read accounts of military history to young Ed and his brother. 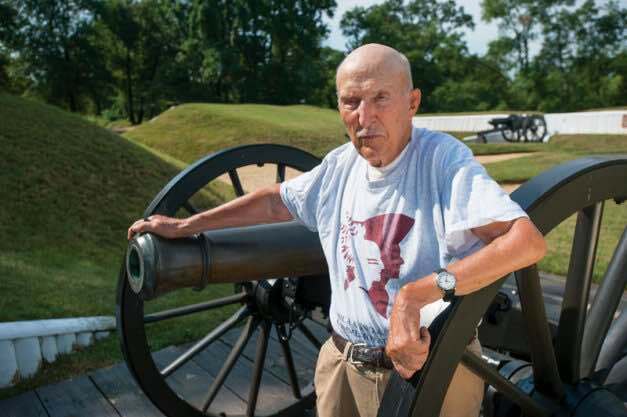 After graduating from Hardin High School in 1941, Bearss hitchhiked around the United States – visiting his first Civil War battlefield in the East. He enlisted in the Marines after America’s entry into World War II, serving as a member of the 3rd Marine Raider Battalion in the invasion of Guadalcanal and the Russell Islands and later, in the 1st Marine Division, in the Battle of New Britain. He was severely wounded at “Suicide Creek”, Cape Gloucester, New Britain and evacuated Stateside where he spent 26 months in hospital and rehabilitation. He was honorably discharged as a corporal in 1946 and returned home to Montana. Bearss used the G.I. Bill to finance a B.S. in Foreign Service from Georgetown University. Shortly thereafter, he received an M.A. in history from Indiana University in 1955. His passion was always military history and, in 1954, he made the decision to join the National Park Service. On-site interpretation of battles was far more interesting than the study of history in an office, Bearss reasoned, which led to his first NPS assignment – Vicksburg National Military Park. It was at Vicksburg that he met his wife to be, Margie Riddle – also an avid Civil War historian. Family lore has it that his first gift to his wife-to-be was a Civil War cannonball. Ed and Margie had three children – Sara Beth, Ed junior, and Mary Virginia (called Jenny). At Vicksburg, Bearss led the research that located and later raised the long-lost Union gunboat U.S.S. Cairo. In 1958, he was promoted to Southeast Regional Historian. As popular interest in the Civil War increased with the upcoming centennial celebrations starting in 1961, Bearss became the “go to man” in the Park Service and nationwide. Bearss was intimately involved in many additions to the national park system including Fort Smith, Stones River, Fort Donelson, battlefields around Richmond, Virginia, Bighorn Canyon, the Eisenhower Farm outside Gettysburg, the gold miners’ route over Chilkoot Pass, President Lyndon B. Johnson’s Ranch, Fort Moultrie, Fort Point, William Howard Taft House, and the Herbert Hoover National Historic Site. In 1981, Bearss was named Chief Historian of the National Park Service, a position he held until 1994. From 1994 to 1995, he served as special assistant to the Director. After his retirement in 1995, he received the title, Chief Historian Emeritus, which he holds to this day.